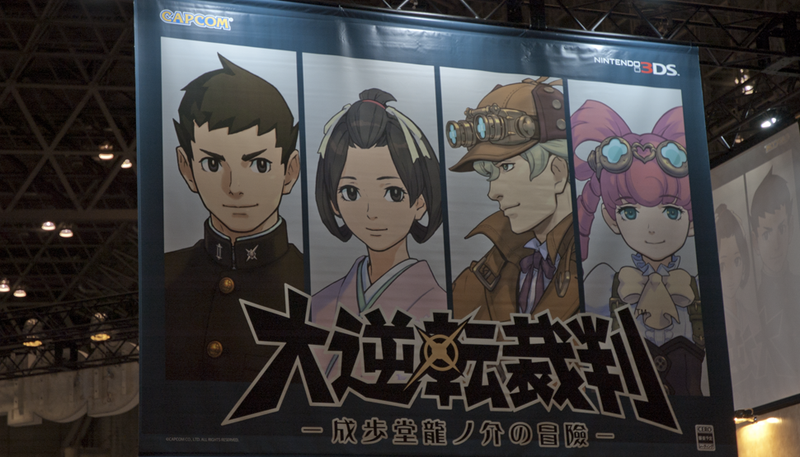 Capcom had a playable demo of the latest Ace Attorney game, The Great Ace Attorney: The Adventures of Ryunosuke Naruhodou at this year's Jump Festa that highlighted the games new addition to the series, the "collaborative deduction" system. The demo was relatively short, taking place on a boat to England where the protagonist and his assistant encounter the master sleuth, Sherlock Holmes, as he interrogates a suspicious Russian man. The collaborative deduction began with Holmes' assessment of the Russian man – who he is and what crime he has committed. The deduction was fairly straightforward with Holmes presenting his evidence and explaining how the evidence supported his conclusions. However, throughout the explanation, something seems amiss, which led to the second half with the protagonist breaking down Holmes' reasoning and unveiling the truth. The way the breakdown works is that in Holmes' argument there are certain phrases or points of focus that are wrong. For example, Holmes states that the Russian man is holding a pair of scissors because he intends to cut off his beard. By using the touchpad to examine the Russian man from different angles, you can focus on any suspicious points on his person. Through this method, you can switch out the term "beard" in Holmes' argument with the real term, which in the case of the demo was his "hair," thus leading to the truth. By finding the flaws in Holmes' explanation – much like finding the flaws in a defendant's testimony in previous games – you reach the truth about just who the Russian man really is, leading to a cliffhanger and a message saying to look forward to the rest of the story in the full game. Short as the demo was, it definitely had the feel of an Ace Attorney game, from the fun character reactions and sound effects, to the way in which characters would go on long monologues. What I got to experience of the new collaborative deduction system was intriguing and left me quite curious as to how the developers are going to further implement it in the full game and what other creative twists they are going to add to it. One issue I felt didn't have as much to do with the demo as it did with the characterization of Holmes. Throughout the events of the demo, Holmes was snappy and full of confidence... And yet, his deduction turned out to be incorrect – which I wasn't sure if it was intentional or not. And even through the dissection of his deduction and the unveiling of the truth, he continued to act as though that was what he had deduced from the start, which left me wondering why the heck he gave a mistaken argument in the first place. Holmes' character description says that "His unparalleled observation and deductive skills see not only the 'truth' but sometimes go beyond the truth and become a 'rampage of logic.'" Yet from what I saw in the demo, I couldn't tell if Holmes was being obtuse, purposefully misleading, or just a moron. I'm not one of those people who thinks that Sherlock Holmes has to be like he is depicted in Sir Arthur Conan Doyle's original works, or the myriad of TV adaptations, but at the same time, I was left confused as to this iteration of the great detective – mostly due to the lack of explanation. No doubt the full game will offer a much more. The Great Ace Attorney: The Adventures of Ryunosuke Naruhodou is scheduled for release on the Nintendo 3DS in Japan in 2015. No word on a Western release.